Common Ground Resource and Crisis Helpline will begin offering Crisis chat and Text services 24 hours a day and 7 days a week. We are looking for dedicated, caring individuals to help move people from crisis to Hope. 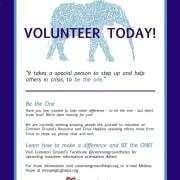 Common Ground offers volunteers crisis intervention training three times a year with the next session starting April 2019. This intensive training will help amazing people to save lives and learn how to help those struggling find the resources and help they deserve. To learn more about all the opportunities Common Ground offers volunteers please attend a volunteer orientation which is held at 6:00 PM the first Wednesday of every month.